USS Abraham Lincoln (CVN-72) is the fifth Nimitz-class aircraft supercarrier in the United States Navy. She is the second Navy ship to have been named after former President Abraham Lincoln. Her home port is Norfolk, Virginia, and she is a member of the United States Atlantic Fleet. She is administratively responsible to Commander, Naval Air Forces Atlantic, and, operationally served as the flagship of Carrier Strike Group Nine and host to Carrier Air Wing Two until 2012. She is currently undergoing a four-year Refueling and Complex Overhaul process. Abraham Lincoln‘s contract was awarded to Newport News Shipbuilding on 27 December 1982; her keel was laid 3 November 1984 at Newport News, Virginia. The ship was launched on 13 February 1988 and commissioned on 11 November 1989. She cost $4.726 billion in 2010 dollars. While heading towards the Indian Ocean, the ship was diverted to support evacuation operations after Mount Pinatubo erupted on Luzon Island in the Philippines. In support of Operation Fiery Vigil, Abraham Lincoln led a 23-ship armada that moved over 45,000 people from the Subic Bay Naval Station to the port of Cebu in the Visayas. It was the largest peacetime evacuation of active military personnel and their families in history. After Fiery Vigil, Abraham Lincoln steamed toward the Persian Gulf, to run reconnaissance and combat air patrols in Iraq and Kuwait, assisting allied and US troops involved with Desert Storm. In early 1992, the ship was at Naval Air Station Alameda on Ship’s Restricted Availability for minor maintenance and refitting. Abraham Lincoln was to be the first Pacific Fleet carrier to integrate female aviators into the crew after the Combat Exclusion Laws were lifted on 28 April 1993. The ship left San Diego on 24 October 1994, to begin refresher training. The next day, Lieutenant Kara Spears Hultgreen, first female F-14 Tomcat pilot, died when her plane crashed into the sea. Her plane lost hydraulic control as she made her final approach. She aborted her landing to the best of her ability in an effort to prevent a collision into the aft end of the ship and the plane inverted and went into the ocean. Radar intercept officer Lieutenant Matthew Klemish ejected safely from the plane and was rescued from the water minutes later. But Hultgreen, who ejected seconds after Klemish, fell straight into the ocean and was killed. Her body, still strapped in the ejection seat, was discovered 19 days later. Abraham Lincoln’s third deployment began in April 1995 when Abraham Lincoln was sent to the Persian Gulf, where the ship assisted in Southern Watch and in Operation Vigilant Sentinel. During an underway replenishment, Abraham Lincoln was run into by USS Sacramento (AOE-1) when Sacramento had steering difficulties due to a split rudder, impacting Sacramento‘s port side, crushing the M-frames, partially crushing a female crew berthing area, and punching a large hole in Sacramento‘s superstructure (TACAN room). Abraham Lincoln was able to continue on with her mission while Sacramento had to dock at Jebel Ali, U.A.E. for several weeks for repair. USS Abraham Lincoln began a fourth deployment in June 1998. Once again, the ship headed for the Persian Gulf in support of operation Southern Watch. During this deployment, the USS Abraham Lincoln carrier battle group launched Tomahawk cruise missiles against two sites. The first was a Sudanese pharmaceutical factory suspected of assisting Osama Bin Laden in making chemical weapons. The second was Bin Laden’s terrorist training camps in Afghanistan. These strikes were ordered by President Clinton thirteen days after terrorists bombed the US embassies in Kenya and Tanzania and was codenamed Operation Infinite Reach.USS Abraham Lincoln was awarded the Armed Forces Expeditionary Medal, and USS Abraham Lincoln carrier battle group the Meritorious Unit Commendation ribbon for its participation. The carrier’s fifth deployment commenced in August 2000 when Abraham Lincoln again traveled to the Persian Gulf in support of Southern Watch. On this deployment, the carrier, air wing and battle group ships earned the Navy Meritorious Unit Commendation. Additionally the ship earned the prestigious Arleigh Burke Award as the most improved command in the Pacific Fleet. Abraham Lincoln was in port on 11 September 2001. She was put to sea on 20 July 2002 to support Operation Enduring Freedom. She took up station once more in support of Operation Southern Watch before taking a port visit to Perth, Western Australia. It was during this time that Abraham Lincoln was ordered to the Persian Gulf to take part in Operation Iraqi Freedom. This forced the Navy to extend Abraham Lincoln’s stay from 20 January 2003 to 6 May 2003. The news of this extension was delivered to the ship’s crew on New Year’s morning by the then Battlegroup Commander, RADM Kelly, with the phrase, “We don’t need to be home holding our loved ones, we need to be here holding the line. Get over it!” The term “Get over it” became the running joke aboard ship, which eventually led to a deployment patch made aboard that read “Westpac 2003 CVN-72 CVW-14 GET OVER IT” with an image intended to depict an admiral kicking a sailor in the groin. Abraham Lincoln and the carrier battle group and airwing helped deliver the opening salvos and air strikes in Operation Iraqi Freedom. During her deployment, some 16,500 sorties were flown and 1.6 million pounds of ordnance used. Sea Control Squadron 35 (VS-35), the “Blue Wolves”, was instrumental in delivering over 1 million pounds of fuel to these strike aircraft, one of the largest aerial refueling undertakings by a carrier aviation squadron in history. The carrier returned home in May 2003, in the process receiving a visit from President George W. Bush before officially ending Abraham Lincoln’s deployment by docking at San Diego before returning to homeport in Everett, WA. Bush stated at the time that this was the end to major combat operations in Iraq. While this statement did coincide with an end to the conventional phase of the war, Bush’s assertion—and the sign itself—became controversial after guerrilla warfare in Iraq increased during the Iraqi insurgency. The vast majority of casualties, both military and civilian, occurred after the speech. The White House said their services constructed the banner. As explained by Cmdr. Conrad Chun, a Navy spokesman, “The banner was a Navy idea, the ship’s idea. The idea popped up in one of the meetings aboard the ship preparing for its homecoming and thought it would be good to have a banner, ‘Mission Accomplished.’ The sailors then asked if the White House could get the sign made. … The banner signified the successful completion of the ship’s deployment,” Cmdr. Chun continued noting that the Abraham Lincoln was deployed 290 days, longer than any other nuclear-powered aircraft carrier in history. In June 2004, following a 10 month docking period, the ship put to sea for the start of working up prior to deployment. 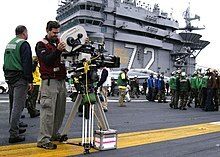 During this period, a film crew was hosted aboard to produce scenes for the film Stealth, which included the presence of a full-scale model of a fictional aircraft, the F/A-37 Talon, that would feature as operating from the carrier. On 1 October 2004, the carrier’s controlling formation was redesignated from Cruiser-Destroyer Group Three to Carrier Strike Group Nine. Abraham Lincoln departed for her next voyage on 15 October 2004. The carrier was on a port call in Hong Kong when the 9.0-magnitude 2004 Indian Ocean earthquake struck southern Asia on 26 December 2004. To help with the international relief effort and assist with search and rescue efforts already underway, Abraham Lincoln deployed to the hard hit western coast of Sumatra to provide humanitarian assistance. The deployment was designated Operation Unified Assistance.Abraham Lincoln‘s Air Transportation Office (ATO) coordinated the flow of supplies into the region, and the carrier provided air traffic control for the relief effort.Sailors from Abraham Lincoln‘s Engineering Department Repair Division designed a potable water manifold to help bring fresh water to Aceh Province, Sumatra, with the system beginning to ship the much-needed fresh water on 4 January. In total, Carrier Strike Group Three delivered 5,929,000 pounds (2,689,000 kg) of relief and Humanitarian supplies, including 2,915,500 pounds (1,322,400 kg) of food and 748,410 pounds (339,470 kg) of medical supplies, during Operation Unified Assistance (OUA). Carrier Strike Group Three received the Humanitarian Service Medal in recognition of its humanitarian assistance/disaster response (HA/DR) efforts during the OUA mission. In mid-January 2005 the carrier left Indonesian waters after the Indonesian government refused to allow fighter pilots assigned to Abraham Lincoln to conduct air patrols and training flights. By law, US carrier-based pilots must practice at least once every two to three weeks to remain “fit,” otherwise they are grounded. Despite the move into international waters, Abraham Lincoln continued to provide support to the region until 4 February. During the carrier’s 33 days on station, she and her battle group, Carrier Strike Group Nine delivered 5.7 million pounds of relief supplies. The 17 helicopters assigned to HSL-47 Saberhawks and HS-2 “Golden Falcons”, attached to CVW-2 flew 1,747 relief missions along the western coast of Sumatra. The carrier’s departure coincided with the arrival of the hospital ship Mercy. Between 7 March – 27 May 2005, Abraham Lincoln underwent a docking planned incremental availability (DPIA) yard overhaul at Naval Station Everett, Washington, and following its subsequent sustainment training, the carrier underwent an additional planned incremental availability (PIA) at NS Everett between 28 June – 26 August 2005. Between 1–23 June 2005, Abraham Lincoln and Carrier Air Wing Two (CVW-2) trained in the northern Pacific, conducting their quarterly Integrated Strike Group (ISG) Sustainment Training cycle.Abraham Lincoln carried out surge sustainment training for the Fleet Response Plan (FRP), fleet replacement squadron carrier qualifications (CQ), and Joint Task Force Exercise 2005 (JTFEX-05) in southern Californian waters between 19 October and 16 November 2005. For JTFEX-05, Abraham Lincoln and Carrier Air Wing Two were joined by the guided-missile cruiser Mobile Bay; the guided-missile destroyers Russell and Shoup, and Carrier Strike Group Seven led by the nuclear-powered aircraft carrier USS Ronald Reagan (CVN-76). On 5 January 2006, the carrier Abraham Lincoln departed its homeport of Everett, Washington, and transited to San Diego, California, for its scheduled underway period to undertake its sustainment training exercisies (SUSTAINEX) and post-refit inspection by the US Navy’s Board of Inspection and Survey (INSURV). Abraham Lincoln completed its additional sustainment training in southern Californian waters between 21–24 February 2006. Carrier Strike Group Nine’s Composite Unit Training Exercise (COMPTUEX) featured twenty-four Sailors from Mobile Security Squadron 2 (MSRON-2), Helicopter Visit, Board, Search and Seizure (HVBSS) Team 1 (pictured), a first for West Coast-based U.S. Navy ships. MSRON-2 Team 1 specializes in boarding non-compliant ships at sea in the dead of night, detaining the crew if necessary, and identifying suspected terrorists or subjects of interest, using the element of surprise afforded by helicopter insertion, night vision equipment, and state-of-the-art biometrics. MSRON-2 HVBSS Team 1 was established in 2004 at Norfolk Naval Shipyard in Portsmouth, Virginia, and it was the first team of its kind to reach operational status. Between 3–30 January 2008, Carrier Strike Group Nine (CARSTRKGRU 9) conducted antisubmarine exercises (USWEx) and Joint Task Force Exercise 03-08 (JTFEx 03-08) off southern California. On 16 January, Secretary of the Navy Donald C. Winter visited the strike group’s flagship, Abraham Lincoln. On 20 January, a NATO Boeing E-3A Sentry Airborne Warning and Control System (AWACS) aircraft was deployed from NATO Air Base Geilenkirchen, Germany, with a multi-national crew aboard for JTFEx 03-08, and it defended Carrier Strike Group Nine from a simulated air attack (30 January). Abraham Lincoln began its planned incremental availability (PIA) maintenance cycle at the Puget Sound Naval Shipyard (PSNS) in Bremerton, Washington, on 16 April 2009. The objective of this PIA yard period is to refurbish Abraham Lincoln‘s shipboard system to meet the anticipated 50-year service life of the ship, including an upgraded Local Area Network system. Beginning 1 December 2009, Abraham Lincoln began daily flying squad, general quarters (GQ), and integrated training team (ITT) drills in preparation for its first underway period following its current maintenance cycle. 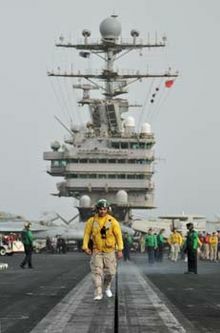 A sailor walking along Abraham Lincoln‘s deck with fellow sailors in the background. On 1 March 2011, the news media reported that the US Navy had awarded Northrop Grumman Shipbuilding-Newport News a $206.7 million USD option under a previously awarded contract to plan Abraham Lincoln‘s RCOH. The planning contract covered the design, documentation, engineering, advanced material procurement, inspections, fabrication, and support work for Abraham Lincoln‘s RCOH, with more than 1,000 employees supporting this planning phase. Additional funding for the RCOH was pending the passage of the U.S. Department of Defense’s Fiscal Year 2011 budget appropriations by the U.S. Congress. Upon authorization, Abraham Lincoln‘s RCOH was anticipated to begin in 2013, and it is scheduled to take between three and four years to complete at an estimated overall cost of $3 billion USD. On 22 January 2012, the US Navy announced that Abraham Lincoln had entered the Persian Gulf “without incident.” The deployment through the Straits of Hormuz came at a time of escalating tensions with Iran. The Lincoln, accompanied by a strike group of warships, was the first U.S. aircraft carrier to enter the Gulf since late December 2011 and was on a “routine rotation” to replace the outgoing USS John C. Stennis (CVN-74). The departure of the Stennis prompted Iranian army chief Ataollah Salehi to threaten action if another carrier passed back into the Gulf, saying, “I recommend and emphasize to the American carrier not to return to the Persian Gulf. … We are not in the habit of warning more than once,” The US dismissed the warning. Abraham Lincoln transited the Suez Canal northbound on 16 July 2012  and the Strait of Gibraltar on 26 July 2012 en route to the United States. On 7 August 2012, Abraham Lincoln arrived at Norfolk Naval Station following an eight-month deployment to the US Navy’s 5th, 6th and 7th Fleet areas of responsibility, in preparation for her Refueling and Complex Overhaul (RCOH) at Newport News. On 8 February 2013, the U.S. Department of Defense announced that the scheduled mid-life Refueling and Complex Overhaul intended for the Abraham Lincoln would be postponed pending the resolution of the upcoming budget sequestration. This budget shortfall would not only affect Abraham Lincoln‘s refueling of her nuclear propulsion plant, but it would also delay the next scheduled mid-life complex overhaul involving the George Washington forward-based in Yokosuka, Japan, as well as the de-fueling of the recently deactivated Enterprise. By March 2013 Naval ship maintenance and overhaul budget issues had been addressed enough such that Lincoln’s RCOH had been confirmed and she was made ready to tow over to Newport News Shipbuilding. By mid-March she had been towed over and docked, and the RCOH work had begun. On Friday 3 October 2014, Huntington Ingalls Newport News Shipbuilding said that its workers had transferred an anchor from Enterprise, the Navy’s first and oldest nuclear carrier, to be installed aboard Lincoln during that week. This was due to one of the Lincoln’s 30-ton anchors needing replacement; the withdrawal of Enterprise allowed one of her anchors to be made available rather than being scrapped with the rest of the ship. “USS Abraham Lincoln”. Naval Vessel Register. Retrieved 12 May 2012. ^ Jump up to:a b “Change in Permanent Duty Station for Carrier Strike Group Nine” (PDF). OPNAV NOTICE 5400 Ser DNS-33/llU228546. Office of the Chief of Naval Operations – U.S. Department of the Navy. 1 August 2011. Retrieved 9 September 2011. Jump up^ “Abraham Lincoln (CVN-72)”. DANFS. Retrieved 12 May 2012. Jump up^ “Kara Spears Hultgreen”. Find a Grave. Jump up^ United States Navy (2 September 2009). “The Lighthouse Joke”. Retrieved 17 September 2011. Jump up^ Mikkelson, Barbara (18 March 2008). “The Obstinate Lighthouse”. Snopes.com. Retrieved 17 September 2011. Jump up^ John Pike. “BGM-109 Tomahawk – Smart Weapons”. Globalsecurity.org. Retrieved 12 May 2012. Jump up^ “OPNAVNOTE 1650” (PDF). Retrieved 12 May 2012. Jump up^ “AV8rstuff.com”. Retrieved 12 May 2012. Jump up^ John Pike. “Globalsecurity.org”. Globalsecurity.org. Retrieved 12 May 2012. Jump up^ Cook, Michael (June 23, 2004). “Hollywood Joins Abe Underway to Film ‘Stealth'”. United States Navy. Retrieved 23 August 2016. Jump up^ Journalist 3rd Class Michael Hart, USN (26 January 2005). “ATO Keeps Relief Workers, Supplies Flying”. NNS050126-03. Retrieved 23 December 2010. Jump up^ Journalist 3rd Class Michael Hart, USN (7 January 2005). “Lincoln Choreographs Supply Drops from Ship to Shore”. NNS050107-12. Commander, U.S. 7th Fleet Public Affairs. Retrieved 24 December 2010. Jump up^ Chief Journalist (SW) Douglas H. Stutz, USN (18 January 2005). “Lincoln Sailors Design Potable Water System, Deliver Water to Banda Aceh”. NNS050118-10. USS Abraham Lincoln Public Affairs. Retrieved 23 December 2010. Jump up^ John M. Daniels (2004). “2004 Command History: USS Abraham Lincoln CVN-72” (PDF). Naval History & Heritage Command. Retrieved 24 December 2010. Jump up^ “USS Abraham Lincoln (CVN-72): Unit Awards Received, with annotations“. Dictionary of American Naval Fighting Ships. Navy Department, Naval History & Heritage Command. Retrieved 21 December 2010. ^ Jump up to:a b c d “USS Abraham Lincoln (CVN-72): 2005 Operations“. Dictionary of American Naval Fighting Ships. Navy Department, Naval History & Heritage Command. Retrieved 21 December 2010. Jump up^ Journalist 3rd Class Dave Poe, USN (13 June 2005). “Lincoln, CVW-2 to Return to Sea for Surge Upkeep”. NNS050613-12. USS Abraham Lincoln Public Affairs. Retrieved 23 December 2010. Jump up^ Journalist 3rd Class Michael Cook, USN (2 November 2005). “Abe, CVW-2 Stay “Ready” With Quarterly Surge Training”. NNS051102-02. USS Abraham Lincoln Public Affairs. Retrieved 23 December 2010. Jump up^ “CCSG 9 Sets Sail for JTFEX”. NNS051102-04. USS Abraham Lincoln Public Affairs. 11 November 2005. Retrieved 23 December 2010. Jump up^ “USS Ronald Reagan, Carrier Strike Group 7 Return from COMPTUEX”. NNS051110-14. USS Ronald Reagan Public Affairs. 10 November 2005. Retrieved 20 December 2011. Jump up^ Communication, Mass. “Deck Department Gives Abe “That New Ship Look””. News.navy.mil. Retrieved 12 May 2012. Jump up^ Journalist 2nd Class Michael Cook, USN (9 February 2006). “Lincoln Ready for Anything During Surge Sustainment Training”. NNS060109-06. USS Abraham Lincoln Public Affairs. Retrieved 20 April 2009. ^ Jump up to:a b “USS Abraham Lincoln (CVN-72): 2006 Operations“. Dictionary of American Naval Fighting Ships. Navy Department, Naval History & Heritage Command. Retrieved 21 December 2010. Jump up^ Mass Communication Specialist 1st Class Bruce McVicar, USN (31 August 2006). “USS Abraham Lincoln Arrives at NBK for Overhaul”. NNS060831-12. Northwest Region Fleet Public Affairs. Retrieved 26 December 2010. ^ Jump up to:a b Mass Communication Specialist Seaman James R. Evans, USB (20 September 2006). “Lincoln Enters Dry Dock”. NNS060920-03. USS Abraham Lincoln Public Affairs. Retrieved 26 December 2010. ^ Jump up to:a b c d e “USS Abraham Lincoln (CVN-72): 2006 Operations“. Dictionary of American Naval Fighting Ships. Navy Department, Naval History & Heritage Command. Retrieved 27 December 2010. Jump up^ “USS Abraham Lincoln (CVN-72): Changes in armament and major systems (Weapons and radar/sonar equipment)“. Dictionary of American Naval Fighting Ships. Navy Department, Naval History & Heritage Command. Retrieved 21 December 2010. Jump up^ Mass Communication Specialist Seaman Kathleen Corona, USN (13 February 2007). “Lincoln Flight Deck Readies for Operations”. NNS070213-01. USS Abraham Lincoln Public Affairs. Retrieved 27 December 2010. Jump up^ Mary A. Mascianica (26 December 2006). “Lincoln Ahead Of Schedule”. NNS061226-05. Puget Sound Naval Shipyard Public Affairs. Retrieved 27 December 2010. Jump up^ Mass Communication Specialist Seaman Brandon Wilson, USN (1 July 2007). “Lincoln Completes Final Fast Cruise, Begins Sea Trials”. NNS070701-09. USS Abraham Lincoln Public Affairs. Retrieved 27 December 2010. Jump up^ Mass Communication Specialist 1st Class Jeannette Bowles, USN (2 July 2007). “Lincoln Heads to Sea Following Nine Months in Dry Dock”. NNS070702-09. USS Abraham Lincoln Public Affairs. Retrieved 27 December 2010. Jump up^ Mass Communication Specialist Brad Wages, USN (3 July 2007). “Lincoln Comes Home, Again”. NNS070703-17. USS Abraham Lincoln Public Affairs. Retrieved 27 December 2010. Jump up^ Mass Communication Specialist 3rd Class James R. Evans, USN (19 July 2007). “Flight Deck Certification Gets Lincoln Back In Business”. NNS070718-13. USS Abraham Lincoln Public Affairs. Retrieved 27 December 2010. Jump up^ Mass Communication Specialist Seaman Recruit Kathleen Corona, USN (22 August 2007). “Lincoln Achieves Outstanding Grade During TSTA/FEP”. NNS070822-07. USS Abraham Lincoln Public Affairs. Retrieved 27 December 2010. Jump up^ Mass Communication Specialist 3rd Class James R. Evans, USN (29 October 2007). “‘Unexpected Company’ Arrives for LincolnStrike Group’s COMTUEX”. NNS071029-05. USS Abraham Lincoln Public Affairs. Retrieved 27 December 2010. Jump up^ “USS Abraham Lincoln (CVN-72): 2008 Operations“. Dictionary of American Naval Fighting Ships. Navy Department, Naval History & Heritage Command. Retrieved 27 December 2010. Jump up^ Mass Communication Specialist 2nd Class James Evans and Mass Communication Specialist 3rd Class (AW/SW) Patrick Bonafede (29 January 2008). “SECNAV Views ASW Exercise Aboard Lincoln“. NNS080129-04. USS Abraham Lincoln Public Affairs. Retrieved 27 December 2010. Jump up^ Mass Communication Specialist (SW/AW) Patrick Bonafede, USN (15 June 2009). “Abraham Lincoln Embodies Navy Ethos to Ensure Mission Readiness”. NNS090615-02. USS Abraham Lincoln Public Affairs. Retrieved 28 December 2010. Jump up^ Mass Communication Specialist 3rd Class Colby K. Neal, USN (23 August 2009). “Lincoln Planned Availability on Track at Halfway Mark”. NNS090823-01. USS Abraham Lincoln Public Affairs. Retrieved 28 December 2010. Jump up^ Mass Communication Specialist 3rd Class Sean Gallagher, USN (29 September 2009). “Lincoln First Carrier to Get LAN Upgrade”. NNS090929-04. USS Abraham Lincoln Public Affairs. Retrieved 28 December 2010. Jump up^ Mass Communication Specialist 3rd Class Jimmy Cellini, USN. “Lincoln Prepares for Underway with Training Drills”. NNS091222-05. USS Abraham Lincoln Public Affairs. Retrieved 28 December 2010. Jump up^ Bacon, Lance M., “Lincoln leaves yard after $250M in upgrades“, Military Times, 14 January 2010. ^ Jump up to:a b Wertheim, Eric (February 2011). “Combat Fleets”. U.S. Naval Institute Proceedings. 137 (2): 92. 0041-798X. Retrieved 14 March 2011. Registration required. Jump up^ “Navy Announces USS Nimitz Homeport Change to Everett, Wash”. NNS101209-21. U.S. Department of Defense. 9 December 2010. Retrieved 11 December 2010. Jump up^ Robert McCabe (1 March 2011). “Northrop Grumman gets $206.7M option on carrier work”. The Virginian-Pilot. Retrieved 7 March 2011. Jump up^ Peter Frost (1 March 2011). “Shipyard gets $206.7M to overhaulLincoln“. Daily Press. Retrieved 7 March 2011. Jump up^ “Aircraft carrier USS Abraham Lincoln Concludes Thailand Port Visit”. Events. Naval Today. 11 January 2012. Aircraft carrier USS Abraham Lincoln (CVN 72), accompanied by guided-missile cruiser Cape St. George (CG 71), departed Laem Chabang, Thailand, Jan. 10, following a four-day port visit. Jump up^ Tony Perry (15 November 2013). “Navy cancels $200 million in contracts with firm in bribery scandal”. Stars and Stripes. Los Angeles Times. SAN DIEGO — The Navy has canceled more than $200 million in contracts with a Singapore-based company at the center of a spiraling scandal involving accusations of bribery and leaking of confidential information. Jump up^ “U.S. aircraft carrier enters Gulf without incident, day after Iran backs from threat”. Haaretz. 23 January 2012. Archived from the original on 2012-02-02. Jump up^ “Pentagon Officials Dismiss Iranian Warning Against US Carrier in Gulf”. Fox News. 3 January 2012. Jump up^ U.S. Fleet Forces Public Affairs. “USS Abraham Lincoln Concludes Eight-Month Deployment”. Navy.mil. Retrieved 15 August 2012. Jump up^ “USS Abraham Lincoln To Arrive at New VA Homeport”. Jump up^ “Navy delays overhaul of aircraft carrier USS Abraham Lincoln, citing budget concerns”. Associated Press. Washington Post. 8 February 2013. Retrieved 2013-02-10. and “Lack of Funding Affects USS Lincoln Refueling and Complex Overhaul”. NNS130208-17. 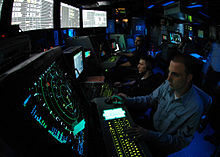 Defense Media Activity – Navy. 8 February 2013. Retrieved 2013-02-10. 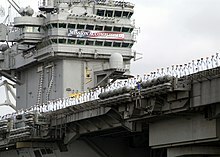 Following a six-week delay due to budget uncertainty, USS Abraham Lincoln (CVN 72) has arrived for its refueling and complex overhaul (RCOH), which will include the refueling of the ship’s reactors, as well as extensive modernization work to more than 2,300 compartments, 600 tanks and hundreds of systems.